A trip to Mexico brings bold flavor from the cuisine to the beer, but you don't have to go on vacation to add that spice into your life. 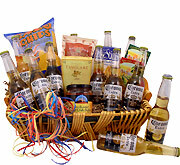 This beer basket is designed to bring the best Mexican beer to your taste buds, and it's the perfect way to give someone special a refreshing buzz. When you think about your life and have nothing to get excited about, it's time to bring those south-of-the-border flavors home. When you have something big to celebrate but can't take the star out for a cold drink, sending this loaded Corona beer basket is the next best thing. 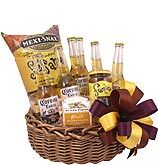 I purchased a Corona gift basket for my father's birthday, which was shipped to him as promised. However, one of the bottles was broken and the edible items were damaged and could not be eaten. So, I called the company to report the matter and expressed my dissatisfaction. Without any trouble and without request, another basket was sent to my father right away and I received a call from customer service apologizing for the mishap. I wasn't sure what to expect when I called about the issue and was pleasantly surprised with the level of professionalism and customer service recovery received. I will definitely continue to purchase gifts from beer gifts. Looking for something to brighten the day of a friend who was just injured, he loved the basket of beer and snack assortment, it was nice to find this type of gift to cheer him up. A friend directed me to your website and I purchased two baskets - one for son and son-in-law. Needless to say, they were both delighted.